It’s been 30 years since Disney debuted its animated series DuckTales, about the adventures of Duckburg’s trillionaire Scrooge McDuck, his grandnephews Huey, Dewey and Louie, and his nephew Donald. And while fans, many of whom now have kids of their own, still have a warm place in their heart for the series, Disney XD is starting from scratch as it reboots DuckTales on Aug. 12, with a marketing campaign that targets favorite kids platforms like Minecraft and Angry Birds in order to hook a new generation. But few series would be as organic a fit for Angry Birds as DuckTales is. “One could argue that the original Angry Bird might be Donald,” said Buhaj. From Aug. 3-12, the characters will be incorporated into Rovio’s main Angry Birds game—with a targeted audience of kids in the XD demo— as a “branded spell” that greets players and explains their mission: to help Donald Duck retrieve Scrooge’s stolen gold from the piggies. 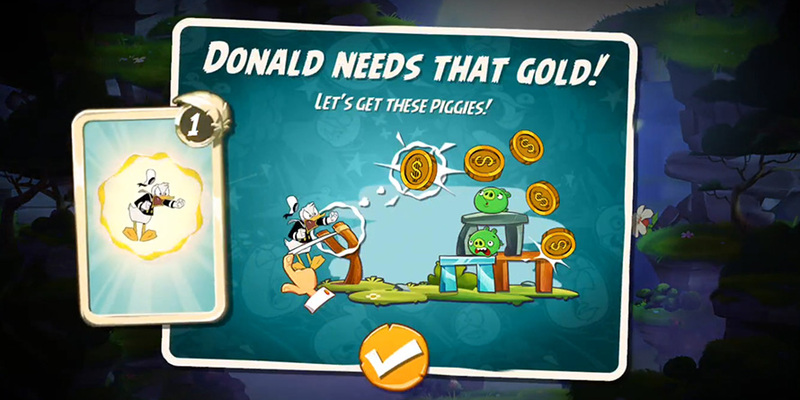 In the game, Donald will sling coins at the pigs and make gold coins rain down on the screen. Then, normal gameplay will resume. “The integration exemplifies branded content, since our ducks seamlessly fit into the Angry Birds universe, it just made sense. A really natural extension,” said Buhaj. The team took a similar approach to Minecraft. In September, Minecraft users can play on an integrated Quackburg server and explore the world of Duckburg, where DuckTales is set. “We’ve got all of the significant geographic locations of Duckburg in Quackburg. 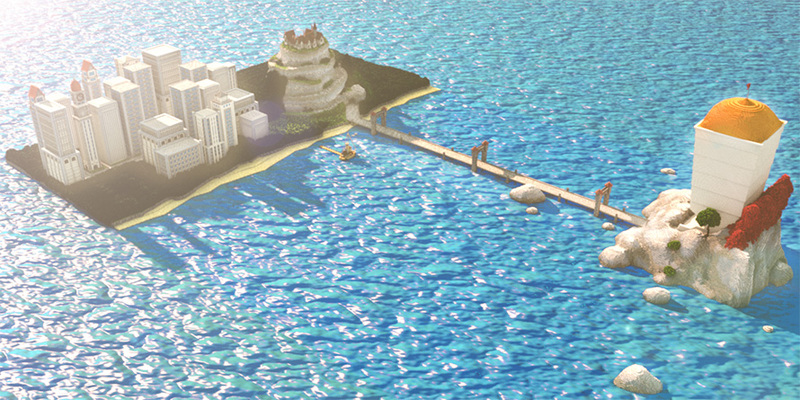 It’s all the places you’ll recognize, and also some new environments,” said Buhaj. While its rare for companies to use Angry Birds and particularly Minecraft as part of their marketing, “it all comes down to having IP that people want to work with and works for their brands as well” said Buhaj. Ahead of the launch, Disney rolled out a series of short-form YouTube videos to introduce audiences to the characters, like this clip from Donald’s birthday, which debuted last month. For Disney, the short-form videos are part of a “content ecosystem” in which stories of various sizes are created simultaneously for multiple platforms. “Rather than being an add-on that gets produced at the end, we launched with six, 30-45 second shorts that really introduce characters to the audience, to that young audience that didn’t know the Ducks,” said Buhaj. Between August and October, Disney will roll out several themed games in the Disney XD and Disney Channel apps to drive more interest in the series. DuckTales: Duckburg Quest, which will launch with the Aug. 12 premiere, is an open adventure game in which players can play as one of the main characters and explore Duckburg or take on frequent troublemakers the Beagle Boys. While much of the campaign is focused on the core demo, some of the marketing elements will appeal to older fans. The DuckTales: All Ducked Out avatar creator, which came out last month, allows viewers to create their own personalized cartoon duck character. Last week, the Disney XD app added DuckTales: Bill Me!, a Snapchat-like filter in which viewers can take a selfie with their favorite DuckTales character and personalize it. “We want our audiences talking back to us, and sharing their love of IP when they’re engaged with everyone else. So the more toolkits that we can drop off to audiences of all ages, I think is always positive,” said Buhaj. DuckTales will launch on with an hour-long premiere Aug. 12 as part of a 24-hour event on Disney XP—repeating the one-hour premiere 24 times—which the network has never done before. “This series is a special one,” said Buhaj. The launch will also include the Disney XD app, Disney XD VOD. Regular-sized episodes will begin airing on Saturday, Sept. 23.